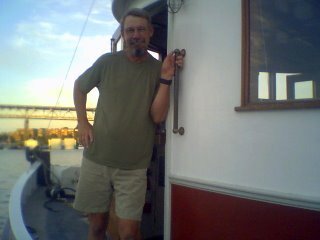 On Saturday night, my longtime friend Steve Vogel invited me over for dinner on his tugboat, along with my brother Tim and sister in law Cathy. The main focus of the night was to go over the pictures (printed from genuine film!) Steve had taken on a recently finished solo bike tour he took in Scotland. Much of the countryside was what you might expect--a lot of green rolling hills, many bays and inlets with the ocean always in the background, and thousands of sheeps, oftentimes threatening bike riders on the very narrow roads. There were very few trees, but the area was absolutely filthy with castles and the remains of castles--very picturesque! For dinner we had some barbecued pork ribs, corn on the cob and potato salad. It was very pleasant sitting on the boat, with its marvelous view of Lake Union and the hundreds of boats going by. We talked mostly about bikes and biking and had a very enjoyable evening. Steve was excited about a new $2900 touring bike he had just ordered, which should match up perfectly with his non digital camera. He has always been one for the classics, though, much like my non microwave sister, who has a telephone that actually rings and has a genuine rotary dial, to boot. But Steve is a classic figure himself: professional woodworker, furniture maker, extremely well-read and now, it would seem, a diehard long distance bike tourer.